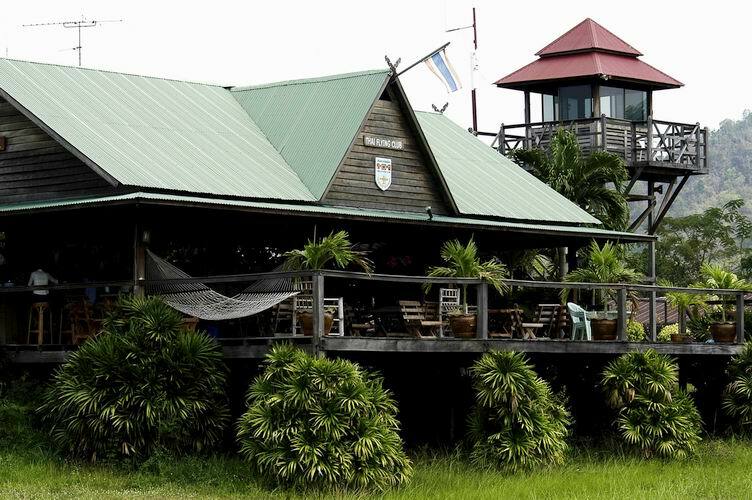 On 25 August 2001, we completed construction of the "Bushpilot Clubhouse" and began planting various types of tropical palms around the clubhouse. The design of the clubhouse is inspired by classical Thai "Sala" design which has the high pitched roof, and a secondary "peak nok" roof skirting around the perimeter. The "Galare" attached to the roof is Lanna style from Northern Thailand; it keeps bad spirits away. Thank you to all club members and visitors who contributed their time and advice and money to make this dream possible. The vision of this clubhouse is to create a place where pilots and enthusiasts can sit and relax to share experiences with each other while watching flying or having lunch. This will make flying safer and more enjoyable for everyone in Thailand. Thank you for your support. Final fund-raising status: 99 sponsors + 3 builders. The "Nakbin Looktung" or "Bush Pilot" bar features Damri Airservice's J-3 Cub flying overhead with flags from other Asian countries. There are also a collection of photographs from the beginning of General Aviation in Thailand - which was not very long ago. The Thai Flying Club was the first private flying club in Thailand and is still one of the most unique and beautiful airstrips in the world. 21 July 2001 was the official opening of the clubhouse with about 150 members. Test pilots fly the envelope to see how new airplanes perform. We used the party to test the structural design of the clubhouse, and now it has been stress tested for 150 people. The clubhouse lounge with pictures of early Thai General Aviation pioneers. 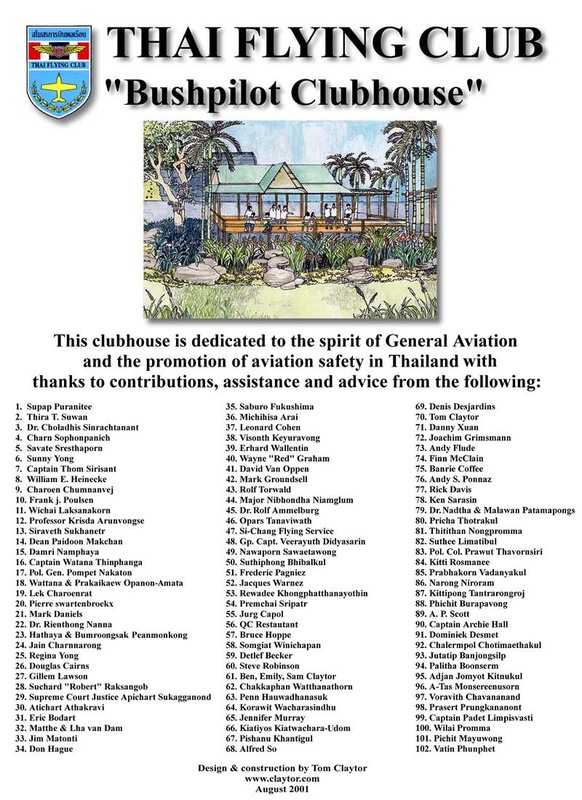 Thai Flying Club is responsible for pioneering General Aviation in Thailand over 20 years ago, and much of the progress is due to these early aviation enthusiasts. Thailand is the leading country for General Aviation in Asia. This is a profile view of the Bush Pilot Clubhouse and the classic style ceiling fans to keep you cool. The clubhouse has hammocks for relaxing after flying and provides a beautiful view of Runway 23, where you can watch people turn inside the mountain and come in to land. The "peak nok" keeps the rain from blowing inside during storms. The clubhouse "sala" has an open design on 3 sides to provide cool air circulation and good viewing of the entire runway. Club president, Khun Thira T. Suwan, and Captain Wattana Thinphanga from Thai airways at the clubhouse opening party in the very early hours of the morning. We began construction of the clubhouse on 12 May 2001. The ground-breaking ceremony was on 28 April during Jennifer Murray's visit to Bang Phra with her Robinson R44 helicopter. Adjan Pieboon, the Dean of Kasetsart Bang Phra, very kindly donated "maak daeng" palm trees to plant around the clubhouse. The clubhouse dimensions are 16 meters across by 12 meters deep. The porch structure is supported by 5x5 inch beams of "mai teng" which is very hard wood that will keep the termites from eating it. The approximate cost of the structure came out to be close to 2,000 Baht per sq. meter. The beginning - sand, gravel and lots of cement. Our favorite Thai supasit (proverb) at this point in the project was "Fan Hai Glei, Pai Hai Teung" (as far as you dream, you can go). Adjan Krisda (the former Governor of Bangkok) sharing some of his advice on clubhouse design. Khun Charn and Khun Supap driving nails on the deck of the new clubhouse. Khun Charn has been teaching us that an angle of 30 degrees is the most effective angle for the nail to hold the board down. Khun Jim giving advice on how to make crooked warped boards straight. Jurg demonstrating Swiss-style hammering technique. Khun Tang (Group Captain Veerayuth Didyasarin) from Tango Squadron stopping by with Khun Nawaporn and Khun Sittipong to inspect the clubhouse and to make a clubhouse donation. Matte and his wife Khun Lah stopped by to assist in the early morning. We thought they would help for an hour; they worked for the entire day, and we would not have been able to complete the deck without them. Khun Add advising Mr. Jim and Captain Penprapa. 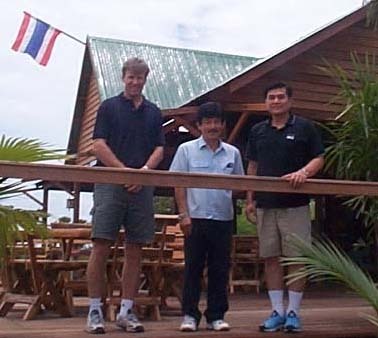 Tim and Steve (Tom's cousin visiting from USA) were conscripted during their brief visit to Thai Flying Club to help with the clubhouse. Steve enjoyed it so much, that he then donated some funds to become a "clubhouse sponsor." Clubhouse Gang showing the days blisters from hammering nails. The first aerial photo of the clubhouse project thanks to Khun Lek. Khun Pricha giving Tom engineering advice on Thai "Sahlah" design. New tables and chairs made from "Mai Sap" which we have found for 5,000 Baht per set. Architects Bill Callahan and Khun Lek Prabhakorn and club president Khun Thira T. Suwan giving advice on roof design. Khun Savate and Khun Tom pretending to do something important. Khun Tarn and Khun Charoen help drill the deck railing. Sunny Yong helping Matte line up the rail. Khun Frank arrives to celebrate with Khun Sanan and the "splice team" who spliced together the roof support beams that will hold up the roof. Il existe! - "Le Baron Rouge" stops by for a surprise clubhouse inspection on Saturday and proclaims: "tout ca va bien; bon continuation." Putting up the kingpost and balancing on a ladder 15' in the air, Khun Tom takes orders from Poojagan Duat who says, "do it." Poojagan Duat balancing on the kingpost to secure the rafters by nail and bolt. "Nok" the clubhouse mascot has been an active participant in clubhouse construction everyday. If Poojagan Duat forgets to feed him, he flies up onto the roof and grabs the drill key or perches on our heads until work stops and he is fed. Landscape drawings kindly provided by Adjan Hin from Kasetsart Bang Phra. "Maak Daeng" palm trees donated to the clubhouse project by Adjan Pieboon the Dean of Kasetsart Bang Phra. Khun Tom presenting an aerial photograph of Kasetsart Bang Phra to Adjan Pieboon for his generous and enthusiastic assistance with the clubhouse project. Clubhouse progress as of 28 June 2001. This is what the area looked like before construction. Khun Charoen Paint 0 0 40,274.50 ????????????????? Khun Lek Transport 0 0 40,274.50 ????????????? Num Fon Tree 0 0 40,274.50 ???????? 3 ??? Khun Add Tool 0 0 40,274.50 ?????????????????????? ?